This obituary initially caught my eye because of the links to Broadford and Doonass. Mary Ann Massy, later Morton, is reported as the eldest daughter of Henry Massy, step-brother to one of Clare’s famous land-owners, Sir Hugh Dillon Massy. However as I explored further, more information came to light, emphasising the importance of seeking out multiple sources. While there are common threads between most of these obituaries, each adds something new. By the end of the reading we have a more holistic idea of her life. One unusual omission is any reference to children though they are mentioned in the final story, a tale of black-white conflict on the colonial frontier. An interesting connection is her husband’s involvement with the US Army in the Mexican War, another frontier battle. Mary Ann Massy was 90 when she died. She had been born in Limerick and arrived in 1854 aged 18 according to the reports but the NSW state records reveal she was 19 when she arrived on the Patrician in 1854 (her occupation given as a laundress) with her relative, Mrs Lubling who was in business in Sydney (see her husband’s story here). Mary Ann stated her place of origin as County Clare. 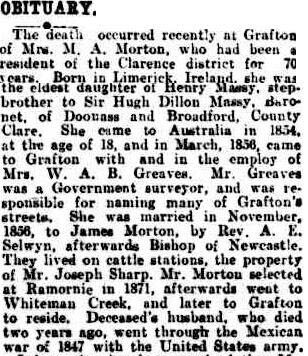 Mary Ann moved to the Clarence in 1856 with Mrs Greaves, the surveyor’s wife, for whom she worked (Brisbane Courier 4 February 1926, page 18). Mary Ann was married to James Morton in November 1856 by Rev AE Selwyn, later Bishop of Newcastle. 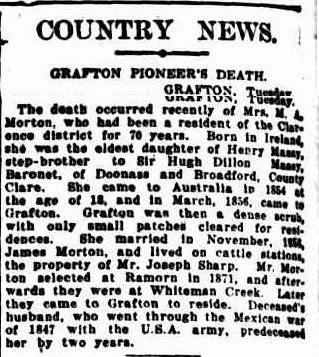 The couple lived on the cattle stations of Mr Joseph Sharpe before selecting property at Ramorn(ie) in 1871 before moving to Whiteman Creek and later Grafton. The couple were early settlers in the Clarence area, and Mary Ann lived there for 70 years. James Morton was with the US Army during the Mexican War in 1847. He died two years before Mary Ann, in 1924. His obituaries are particularly interesting so I’ll be including them in a Trove Tuesday post today on my main family history blog. And a child’s death, as well as the two males listed above. The gravestones can be seen on the Australian Cemeteries Index site. Mary Ann’s early colonial life was at the interface of the frontier of black-white relationships. I’ve pondered whether to include this story however I think it’s an important part of our colonial history. A similar story was published in Lismore’s Northern Star on 1 February 1926. While the language, and even more the events, are confronting to us in the 21st century it reveals the battle between the races as the British assumed that they had occupied Terra nullius and the Aborigines were fighting for their land, and survival. Probably few of our earliest Australian ancestors were free from these actions or attitudes so perhaps it’s best for our sensitivities that obituaries rarely make mention of them. 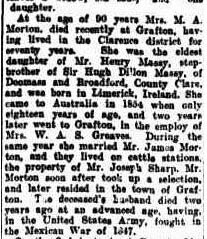 This entry was posted in Broadford, Doonass, East Clare Ancestry, Grafton, Limerick, New South Wales, Patrician (1854) and tagged James MASSY, Mary Ann MASSY, Mary Ann MORTON, Mexican War, Sir Hugh Dillon MASSY by cassmob. Bookmark the permalink. 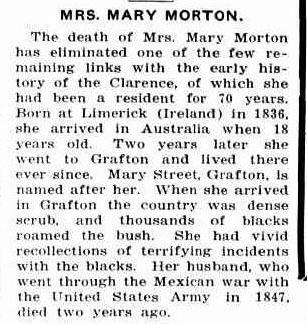 Have written to you before about all my East Clare relatives but was very excited to read your post on Mary Morton nee Massy. I have quite a lot on her cousin Mrs Lublin who was my ggg aunt Mary Ann Whelan whose mother was a Massy She arrived as a bounty immigrant in 1838. Can provide more info if you like. Another co incidence is that one of the Lublin sons was living in Urana about the same time as your relatives Am away from home and all my research at the moment but can check the dates when I get home. PS John Lublin was a successful Jewish hatter in Sydney. hi Gabrielle, thanks for getting in touch…I’ve been away too, so we’ll connect again in due course. Isn’t it strange how families overlap in areas. Given the size of Urana they’d have to have know each other. Look forward to hearing from you ( my email is on the about me page) . Would love to hear about the connections.